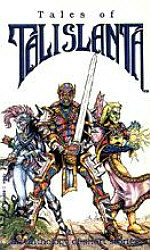 The game by famed FRPG writer Stephan Michael Sechi and Bard Games. 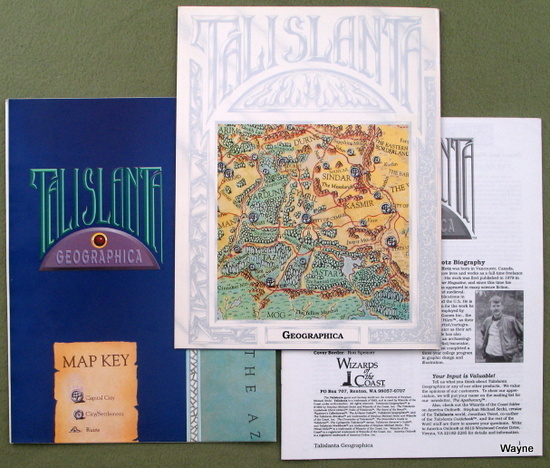 (See also their Atlantis RPG and 'Compleat' series of supplements.) I remember the ads for the early editions boasted "NO ELVES!!." The background is strange, unlike the typical FRPG setting. The works of Jack Vance (Dying Earth) figure prominently as inspiration. It would appeal to players who enjoy Tekumel, and the like. 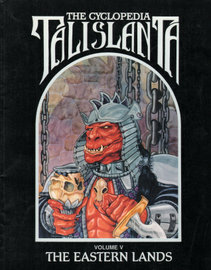 The Minotaur’s Lair has a great reference section on Talislanta. 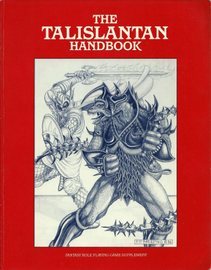 It all started here (1987), in this sourcebook. It is not attached to a game system. 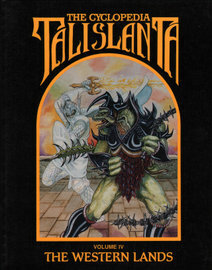 -FOR EXPERIENCED PLAYERS AND GAMEMASTERS ONLY-"
"The TALISLANTA series continues with the NATURALIST'S GUIDE, a compendium of selected flora and fauna native to the magical realm of Talislanta. With a separate section for fantasy role players featuring game statistics and additional information." exciting FRP campaign unlike any you've ever experienced before. 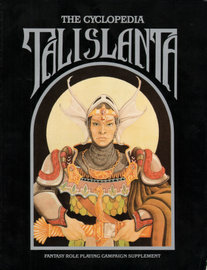 * Plus updated information on character backgrounds, optional rules for combat, languages, currencies, Talislantan chronology, and much more..."
"Nestled in east-central Talislanta, the Seven Kingdoms is the spiritual heart, if not the geographical center, of civilized Talislanta. A loose union of semi-autonomous states, this nation is a prosperous, enlightened society where knowledge and advanced crafts flourish. The Seven Kingdoms is a crossroads for travel from eastern and western Talislanta, since roads are surer and safer than the sea. Merchants wishing to cross the continent by land must either use the Seven Roads (and pay the tolls and tariffs), or risk a dangerous journey across Drag or the cold northlands. The land ranges from the rocky, desert wastes of Sindar and Kasmir to the dense forests of Astar and Vardune; from the tropical jungles and swamps of Taz to the lightly wooded open country of Cymril and Durne. The Axis River forms the western border, keeping Aaman at bay. The waterless Dead River canyon performs the same function in the east, keeping the bandits and raiders of the Wilderlands of Zaran at bay. The mountains of southern Urag, and the dense swamps and mountains along the borders with Mog and Jhangara, likewise provide protection on the northern and southern frontiers." "Sprawling across the center of the continent, the Wilderlands of Zaran is the devastated wasteland that separates the civilizations of eastern and western Talislanta. It is dominated by sterile wastes where only the most stubborn types of vegetation can survive. The Wilderlands Road — one of the last remnants of the ancient Kingdom of Zaran — connects the prosperous and modern Seven Kingdoms with the old Empire of the Quan in the east. Merchants and Aamanian pilgrims regularly traverse the highway, which is haunted by bandits and thieves. While the merchant who gets his caravan through can expect a rich reward, those who fail often leave their bones bleaching in the desert suns. The Volcanic Hills and Rajanistan's desert form the western border, keeping the eastern imperials at bay. The waterless Dead River canyon performs the same function in the west and south, retarding the expansion of the Seven Kingdoms. To the north, only the limitless wastes provide a defense...but then, few seem intent on conquering this profitless region." 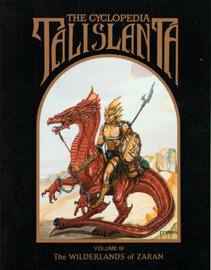 "Cyclopedia Talislanta Vol IV, The: The Western Lands presents an in-depth look at the lands to the west of the Seven Kingdoms. Cultural and political information about the Aaman, Zandu, and the other western countries. Contains two adventures." 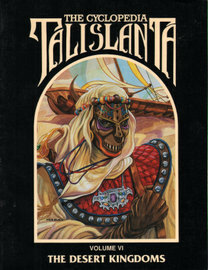 "Eastern Talislanta is a place of danger and barbaric splendor, its fabled riches and mysteries drawing adventurers from across the continent A few find their fortune. Others find terror and horrifying death. The East includes the barren steppes of the Greylands, the chill mountains of Xanadas, the lush jungles of Ghana, and other extremes of terrain. Much of it is unexplored, and home to dangerous predators and hostile sentients." An in-depth look at Dracarta, Rajanistan, and their outlying lands. Contains three adventures. 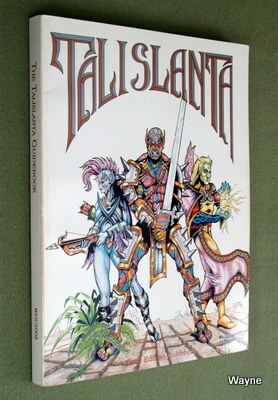 3rd edition, published by Wizards of the Coast in their pre-D&D days. "With its abundance of strange and often dangerous flora and fauna, Talislanta provides ample material for a naturalist's life work. Thystram's Collectanea, the life work of Talislanta's greatest naturalist, finally collects detailed descriptions of most life forms native to the continent of Talislanta and surrounding planes into one organized book. Supplemented by the research of various historical figures and modern scholars, all entries have been revised and updated to reflect recent discoveries. 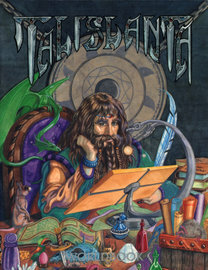 With its accurate illustrations and helpful encounter lists, Thystram's Collectanea will prove a valuable resource to any who would travel the lands of Talislanta." Ocean and Wind Currents; Languages; Talislantan Socio-Political Conflicts; A Matter of Lineage (adventure); Against Chalgus of Ur (adventure); Abrim's Dilemma (adventure); Nightmare's Gate (adventure). "Lost spells and skills, artifacts and magical treatises, tidbits of history forgotten since the days of the Archaens—these ancient secrets have now been brought to light for the first time in The Archaen Codex. 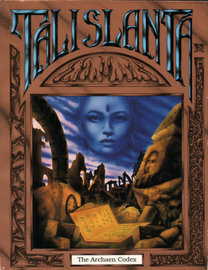 In this book, you will learn the origin of the Black Savants, the technomantic techniques of the Neurians, the summoning spells devised by the magician Mordante, and the nature of the ruins in which these and other wonders of Talislanta's greatest magical era may be uncovered. So pack your research notes; the treasure hunt has begun!" 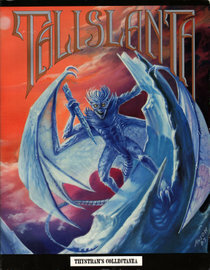 "Get involved in the rise of the Sub-Men with the first full-length adventure ever published for the Talislanta system! 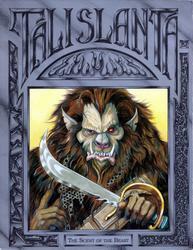 Designed as a starter kit, The Scent of the Beast introduces both players and GMs to the rules and setting of Talislanta in a mystery adventure that samples from several different styles of play. Let your players journey to Sindar in search of a traitorous arms merchant and experience the first of a series of adventures that will take them straight to the heart of the Sub-Men uprising." 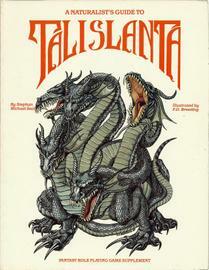 "Immerse your PCs in one of Talislanta's lushest cultures with Sarista, the first sourcemodule for Talislanta! As a sourcemodule, Sarista provides both detailed background information on the Sarista and a short adventure that lets you use some of that material right away. Details on Sarista customs, skills, equipment, and magic add flavor to this colorful race, while information on the landscape and creatures of Silvanus fleshes out the Sarista homeland. A few special NPCs and a sample Sarista clan provide inspiration for your own adventures, while the short adventure included sends your PCs to investigate possible Tanasian activity in Silvanus. Whether your party is visiting the Western Lands or being visited by a Sarista caravan, you'll find plenty of good ideas in Sarista." 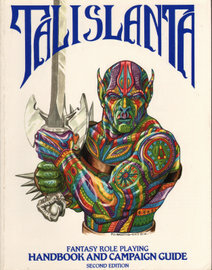 "The coming of the Tirshata heralds the end of oppression for the savage Sub-Men — and could mean the end of civilization for Talislanta, as well. This campaign covers four years of intrigue, adventure, and all-out war, as the legendary Sub-Men hero known as the Tirshata returns and unites the scattered Sub-Men tribes. 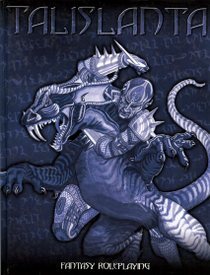 This book features extensive and creative cultural notes on each Sub-Men tribe, plus a detailed timeline of the war, numerous scenario hooks, and a final climactic adventure: 'The Heart of the Beast.' 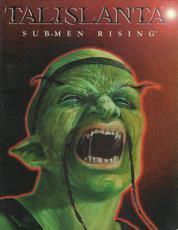 Sub-Men Rising is for the Talislanta gamemaster looking for a long-term campaign of passion and fury." The Crimson Horde is now recruiting mercenary cavaliers to supplement Kang road patrols in certain isolated corners of the Quan Empire. Recruits will be paid 100 gold lumens per day, plus equipment valued at over 700 gold lumens. See an Ispasian representative for more information. Let your players explore the mysterious Quan Empire, choose between duty and conscience, and affect the course of Talislantan history in this epic adventure of cultural clashes and military intrigue. Designed for 3-6 characters of 4th-7th level, Quantrigue uncovers for the first time what's really going on beneath the surface of the Quan Empire since the Kang took control in 611 N.A. So expose your players to a little Kang culture; neither they nor the empire will ever be the same!" 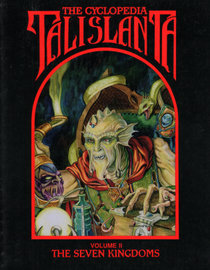 "I have to admit, I would have bought this book no matter what, since I am such a huge fan of the Talislanta role-playing game. Fortunate for me that the stories in here are of very high calibre, and make entertaining reading. "The first story, 'Tamerlin's Oddesy,' details the origins of the famous explorer, taking the reader up to the very moment where 'Chronicles of Talislanta' starts. "'Tulki's Revenge' deals with an young man's assault on his home, the ocean-going city of Oceanus. "'Survival' is a short and brutal tale that depicts live among the tribes living in the desolate land of Harak, with a twisted ending. "'To Rest in the Sea' is a story about one slave in the Quan Empire and his yearning to be free, and the length he will go to achieve that. "'Rogues' is a humorous tale of three thieves, each with very different styles, competing to see who is the best in all of Zandu. "'Of Women and Honor' tells of a Farad merchant and his first major slave-trading mission, and what happens when affairs of the heart clash with money-matters. "'The Ring' is a funny tale of Pix, the ferran (a rat-like humanoid), and his extraordinary adventure in retrieving a lost ring. "'Finding the Way' is a touching story of a "green man" (a race of diminutive humanoids who communicate with plants) and his devotion to life and love of his friend, a mandalan mystic warrior. Imagine a world beyond the realm of traditional fantasy roleplaying — a world of strange and exotic cultures, fantastic flora & fauna, ancient magics, and lost civilizations. 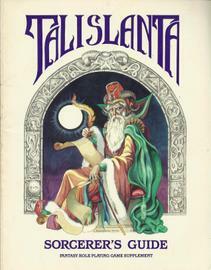 Talislanta is a world unlike any other. 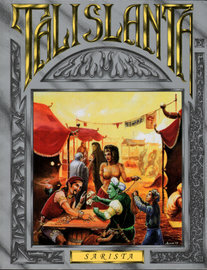 The Traveler's Guide: over 300 pages of detailed information covering the history, cultures, creatures, and geography of Talislanta. Easy-to-use Action Table system: a single adaptable mechanic for combat, spellcasting and skill use, so there's no need to constantly refer back to the rules during play. 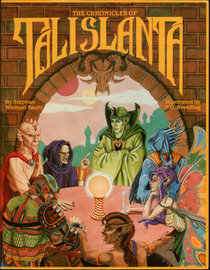 Over 120 character archetypes — with everything a player needs to know to start adventuring in the world of Talislanta right away. 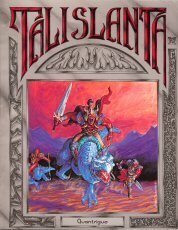 A comprehensive Game Master's guide helps you plan your adventures and introduce your players to the rich and diverse world of Talislanta." An eerie twilight world inhabited byTarteran demon hunters, Ebonite soul traders, merciless Brood reapers, and many other terrifying and mysterious denizens of the lower planes. 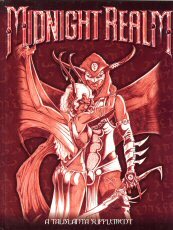 Midnight Realm is a dark fantasy setting that provides players and Came Masters with an exciting new world to explore. 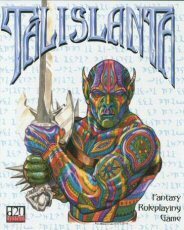 Designed for use with the Talislanta Role Playing Came, Midnight Realm can also be adapted for use with other RPCs, or simply used as a source of new ideas to add to your own world."